PowerPoint Online plays music and other sound effects that you’ve added to your slides using the PowerPoint desktop application, but you can’t add them from within PowerPoint Online yet. 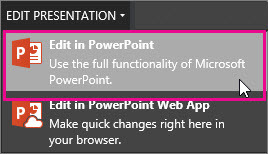 In PowerPoint Online, click the Edit Presentation tab, and then click Edit in PowerPoint. Note: When you save the presentation, it is stored to the same location you opened it from in PowerPoint Online. PowerPoint Online is regularly updated. Check out the PowerPoint Blog and Office Online blog. PowerPoint Online is a great way to work on documents in your browser, but you can do even more when you use it alongside the desktop PowerPoint application. Try or Buy the latest version of Office now.